Another inspiring trip was on the agenda this week. Lake Tahoe – snow showers and all. The trip up from Reno was a bit harrowing as there are a few places where I was alone on the road. It was snowing heavily and there were a few icy patches but I managed to get past the intense part of the road with the chains still on the seat beside me. Hey, I could have put them on! I laid them out on the seat and read the directions at one point, but decided to forge ahead without them despite the flashing yellow lights half packed with snow that warned “Snow tires or chains required when lights flashing.” It was an adventure! I made it to the Hyatt on the beautiful North Shore in record time. Lake Tahoe is inspiring and I enjoyed shooting some great scenes, capturing snow and ice streams, the mountains and the majesty of Lake Tahoe for the upcoming TV ArtScapes® SnowScapes DVD. Every nite I took advantage of the big fire pit by the lake. 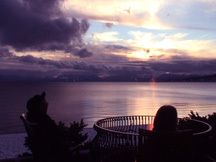 People talking, drinking wine, smiling….all at a fireside pit, watching the clouds as they seemingly turn into red and orange fire behind the snowcapped mountains. Strangers, chatting about the days skiing or yesterdays adventure. I wondered, are they happy? Are they in Love? What do they do? What trials and challenges had they had? There was a girl with a camera. She looked to be about 30, her hair wrapped up in the scarf that kept the outside chill at bay. She was by herself, and had a professional camera……she reminded me of me. She took advantage of the postcard picture setting, always capturing the right moment. By night’s end the moon was full and it was a perfect end to a great day as it made the snow an eerie blue and the water dance with silvery strands of light. So what did all this beauty and people watching inspire? Regret for relationships past, or regret for opportunities missed? Regret for anything? No, instead a setting like this always makes me feel close to nature and therefore close to everyone and everything. It instills a feeling that you are not alone, even though you may be physically alone at the time. A connection that is undeniable…. A connection where you know there is something bigger than all of us. And thank goodness for that! It also inspires thankfulness. Thanks for being able to get away for awhile from the fast paced, techno world we live in. Thanks for time to read a book, slow down and enjoy the moments of now, because that is all there is when you really think about it. All in all, it was a great trip. I recommend these small trips for everyone. They truly rejuvenate and can help you gain your common sense perspective on life. And if you can’t get away to enjoy the majesty of nature, Here it comes……….I do recommend the TV ArtScapes® nature DVDs! Shameless self promotion, I know, but someone has to do it! Happy New Year People! Peace and Love to all. Let’s make this year a good one!